1. Preheat oven to 300 degrees. Toast pecans for 15-20 min. or until fragrant. 2. Combine cranberries, orange juice and ginger in a small saucepan over medium-low heat. Cover and cook, stirring occasionally until berries begin to pop, about 10 min. 4. Grate squash in a food processor. Transfer squash to a large bowl. Add warm cranberry dressing and toss to combine. 5. Top salad with toasted pecans. Serve warm or at room temperature. 1. 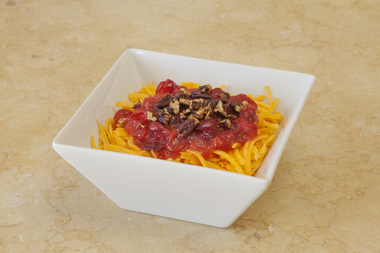 Combine the agave nectar, mustard and olive oil in a small bowl and stir together. 2. 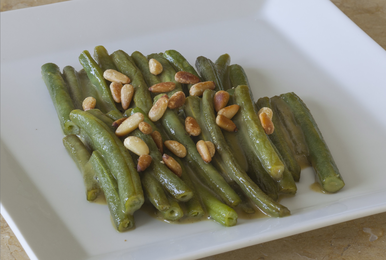 Trim the ends off the green beans and cut them in half if they are very long. 3. Place the beans in a skillet with just enough water to keep moist. Steam until bright green and just crisp-tender. 4. Pour in the agave-mustard mixture and a pinch of salt. Turn up the heat to medium-high and cook, stirring, until the vegetables are nicely glazed, about 2-3 min. 1. Place millet and amaranth in a pot with vegetable stock and salt. Bring to a boil, cover, reduce heat and simmer until all the liquid is absorbed. Remove from heat and set aside. 2. In a large Dutch oven, saute onion over medium heat in oil for 3 min. until soft. Add carrots, peas and corn and continue to saute until heated through. 3. Add mirin, fold in kale and collards and saute until tender and bright green. 4. In a small mixing bowl, whisk water, tamari and arrowroot. Pour over veggies and stir until sauce starts to thicken. Remove from heat. Transfer to a casserole and set aside. 6. When grains are done, mix in parsley and season with salt and pepper. Stir to combine and spread evenly over veggies. Drizzle with olive oil and broil for 5 min. or until crust is golden and crispy. Remove from oven and serve hot. This salad is very low in cholesterol and sodium. It is a great way to get a boost of antioxidants. It is a very good source of vitamins A and C as well as a good source of manganese. These bean are very nutritious. They are very low in cholesterol and fat. They are a great source of fiber, manganese and vitamins A, C, and K. They are also a good source of B vitamins, calcium, iron, magnesium and postassium. 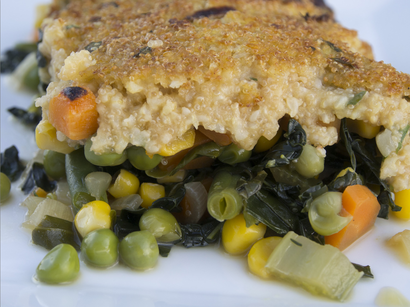 While this dish isn't your typical stuffing, the grains and veggies add a nice appearance to the table. They are low in saturated fat and very low in cholesterol. In additions, this is a very nutritious side and low in the glycemic index. This casserole is a good source of dietary fiber and manganese and is rich in vitamins A, C, and K.
1. Bring cranberries & water to a boil. Simmer until cranberries start to pop. 2. Add apples & continue to cook for 5 min. or until apples are tender. 4. Remove from heat & stir in orange rind & nuts. 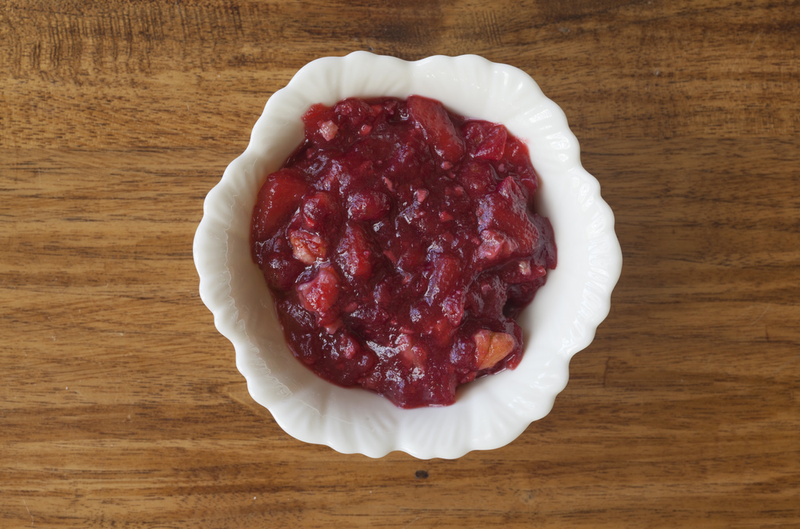 This cranberry sauce is low in saturated fat and very low in cholesterol and sodium. However, it does have a large portion of it's calories from sugar. Remember a little goes a long way. It is a good source of manganese and is also anti-inflammatory.